The Package Includes: • Rental time starts when set-up begins and stops when clean-up is complete/doors locked. • Additional charges of $400 per hour will be applied should events go past the time allotment. • One-half (1/2) of the estimated rental charge is due at the time the contract is signed. •Remaining balance is due 48 hours prior to event date. Rental Hours: Tuesday & Saturday - 7:00am-9:00am or 5:00pm-12 Midnight Sunday & Monday - 7:00am-12 Midnight Rental Rates: Theater Only (2 hrs. min) - $ 400.00 per hour Museum Gallery & Hangar (4 hrs. min) - $ 400.00 per hour Administrative Fee/Membership - $ 50.00 Non-refundable Please review our attachment for complete details. The C.R. Smith Museum’s historical collection of American Airlines and airline industry memorabilia, as well as current interactive hands-on aviation displays, offer our visitors an experience that is fun as well as educational. 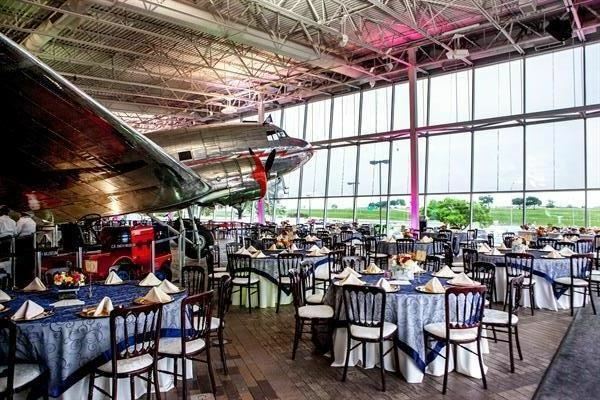 With its Event Rental Program, the Museum provides a unique and exciting setting for private gatherings and corporate entertaining. We are able to accommodate groups of all sizes. That could range from 10 to 300 guests for a sit-down dinner and 500 people for a buffet-style reception, complete with a band. • If you book by September 18th save 10% off on price Please visit our website for more details. They great to work with for your event.